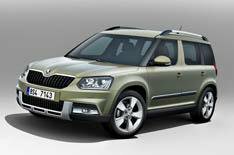 2014 Skoda Yeti revealed | What Car? This is the new Skoda Yeti, face-lifted for 2014 and ready for its public debut at the forthcoming Frankfurt motor show. Skoda is claiming that the revised line-up of its popular SUV is being 'split in two', with a distinction between urban-focused models, which get body-coloured bumpers, and more rugged versions, which retain black plastic items. The styling tweaks include new headlights that are available with bi-xenon technology for the first time, redesigned tail-lights that can be LEDs, four new designs of alloy wheels, and a range of new colours, including four new metallic finishes. In truth, though, the most significant changes come in the cabin (with new seat fabrics, trims on the fascia and a fresh steering wheel design), the engine and transmission line-up, and the standard equipment list. The engine line-up has three turbo petrols - a 1.2 unit with 103bhp or xxkW, and a 1.4 with 121bhp - and four diesels, a 1.6 with either 103bhp or xxxbhp and a 2.0 with 138bhp or 168bhp. The most powerful of those engines is the range-topper; it will be offered with four-wheel drive and an automatic six-speed dual-clutch transmission. The cleanest model will be badged Greenline and will be based on the front-wheel-drive version of the car. As with the current model, it gets a 1.6 TDI engine with 77kW and a six-speed manual gearbox. CO2 emissions remain the same, at 119g/km. Current Yeti features, such as the fold-down backrest of the passenger seat, folding teams on the front seat backs, bottle holders, and fold-down hooks in the boot, are all retained. There are also new interior features, such as a double-sided floor covering in the boot, a detachable LED light, a vest holder under the driver's seat and a waste container in the side of the door. A rear parking camera (the first on any Skoda production car) will be offered as an option; it brings Optical Parking Assistant, which can reverse parallel park the car automatically. The new Yeti will make its public debut at the Frankfurt motor show next month, and sales should begin at the start of 2014.